The Boise Nationals Soccer Club (BNSC) Arsenal U-14 boys’ team coached by Jon Curry has been pretty unbeatable at the Idaho Youth Soccer Association State Cup tournament held in Boise. Last Sunday, BNSC U-14 completed its second straight 4-0 unbeaten run in the State Cup tournament with a 4-1 championship game victory over BNSC Chelsea at Simplot Sports Complex in Boise. The Arsenal boasted a 27-2 goals-against in its four wins, comparable to the 32-2 of last year’s 4-0 unbeaten run to the title. Playing defense for the Arsenal both years has been Wood River Middle School eighth-grade student Taylor Koth, 14. His Arsenal team is 22-4-2 this season, outscoring opponents 125-30. 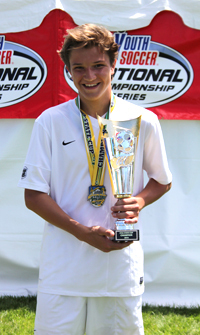 By winning the State Cup, Arsenal qualified for the 2014 U.S. Youth Soccer Far West Regional Championships June 16-22 at Albuquerque, N.M.
Community School sophomore Lilly Jenner was a midfielder for the Boise Nationals U-16 Napoli team that was a semi-finalist and placed third. Other Wood River Valley players on different teams at the State Cup included Olivia Thornton, Sage Kelly, Jon Scott, Jesse Cole, Emmy McCune, Payton Bacca and Ella Viesturs.